Here is another Duluth-in-the-movies sighting. From the 1988 film The Great Outdoors, starring John Candy and Dan Aykroyd. This shirt is worn by the camp host at the beginning of the movie. Great movie. I saw this at "Movies in the Park" a few years ago. 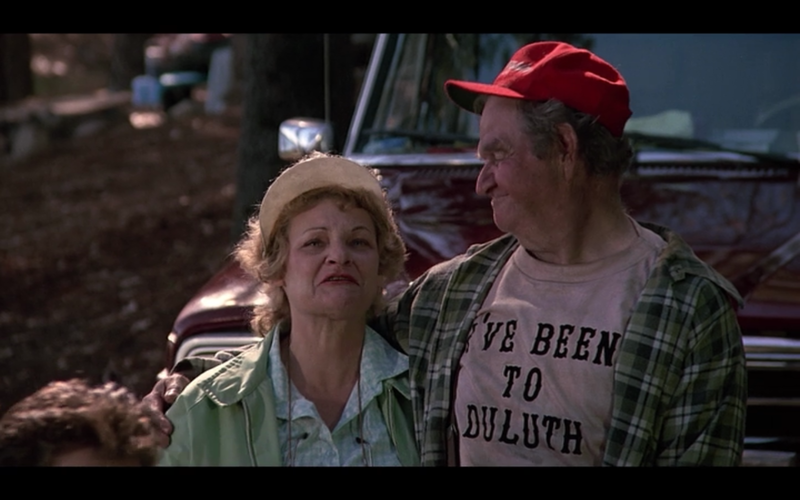 When I moved to Duluth (nigh these seven years ago), the first request from my father was to get him a T-shirt like the one the guy wears in The Great Outdoors. The T-shirt store downtown on East Superior (Bullseye printing I think) has been selling their version of this shirt for years. I don't believe that it actually existed before the movie but was created for it. I believe Waferdog is correct. I think Bullseye Silkscreen and Embroidery developed a shirt like that about ten or twelve years ago, based on the one from the movie. PDD got a shout out in the DNT, and they published the image above, which is a screen shot I made on my laptop. https://www.youtube.com/watch?v=BSoT5R4bnXQ Shanesaw and Scuba Steve have a little fun during today's snow day.